Hair is part of the complete biological system of the human body; disturbance in one part of the system can cause dysfunction in other parts. To maintain optimum health, it is best to maintain a healthy diet and regular exercise regimen. Hair growth and thinning are mostly determined by your genes and the way the hair follicles respond to hormones. A very poor diet can cause thinning of hair and speed up the onset of hereditary hair loss. Getting the right nutrients is important to help keep your hair healthy and shiny. The best way to maintain a healthy vitamin and mineral intake is a good diet. It is not necessary or advisable to go out and buy a bunch of over-the-counter vitamin supplements. It is easy to overdose one with over-the-counter vitamins, particularly when taking supplements of fat-soluble vitamins and minerals, causing toxicity and adverse reactions. The likelihood of doing this is far less with food; therefore, it is always best to obtain the bulk of your vitamin and mineral requirements from whole foods. 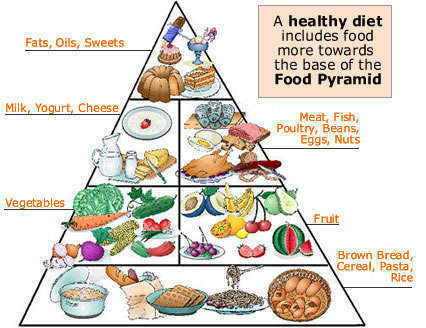 Experts agree that following the Food Guide Pyramid, which is a general eating guide that includes all of the daily food groups, offers a reliable and easy-to-follow plan to guide you through developing a healthy diet. A healthy diet ensures the intake of essential vitamins and minerals that contribute to your health and a healthy head of hair. Regular exercise and stress management are also essential to good health and are important for the prevention and treatment of temporary hair loss. It is suggested to make any change in the diet only after consulting a nutritionist or your health care provider. The hair itself is made up of protein. Meat, fish, milk, cheese, eggs, yogurt, soybean, etc. Sugar, processed foods, fatty red meats, full-fat dairy products; caffeinated products such as coffee, tea, cola drinks and chocolate. They can deplete the body of nutrients and raise adrenal levels, which will cause a chain reaction of producing more androgen and causing hair loss. Vitamin A helps to develop healthy cells and tissues. Its deficiency commonly causes thickening of the scalp, dry hair and dandruff. Liver, fish oil, eggs, fortified milk; red, yellow, and orange vegetables are good sources of vitamin A, as are some dark green leafy vegetables like spinach. These are important to maintain the level of iron, which helps in carrying oxygen from the lungs to the tissues. Brown rice, Cauliflower, Mushrooms, Oats, Sunflower seeds, Walnuts, Soya, Peas, lentils, Cooked egg yolk, etc. Vitamin C is responsible for the development of healthy collagen, which is necessary to hold body tissues together. Its deficiency can cause split ends and hair breakage. Fresh peppers, citrus fruits, melons berries, potatoes, tomatoes and dark green leafy vegetables. Green leafy vegetables, nuts, grains, vegetable oils, and most ready-to-eat cereals, which are fortified with vitamin E.
Ensures healthy supply of oxygen to hair. Zinc is responsible for cell production, tissue growth and repair, and the maintenance of the oil-secreting glands of the scalp. It also plays a large role in protein synthesis and collagen formation. For this reason, zinc is important for both hair maintenance and dandruff prevention. It is necessary for the production of hemoglobin. Good sources of copper are liver again, seafood, nuts, and seeds. Hair needs iodine for growth. Seaweed, salmon, seafood, lima beans, molasses, eggs, potatoes with the skin on, watercress and garlic. Silica is vital to the strength of hair, and although it will not necessarily stop hair from falling out from the follicle, it will stop hair breakage. It works by stimulating the cell metabolism and formation, which slows the aging process. Rice, oats, lettuce, parsnips, asparagus, onion, strawberry, cabbage, cucumber, leek, sunflower seeds, celery, rhubarb, cauliflower, and Swiss chard. EFA are a key component to healthy skin, hair and nails. Deep-water fish such as salmon, sardines, mackerel, trout, or herring. Water is vital to proper hydration, which is necessary in order for all nutrients to be utilized properly by the body, not to mention the proper function of every cell in the body including hair follicles.